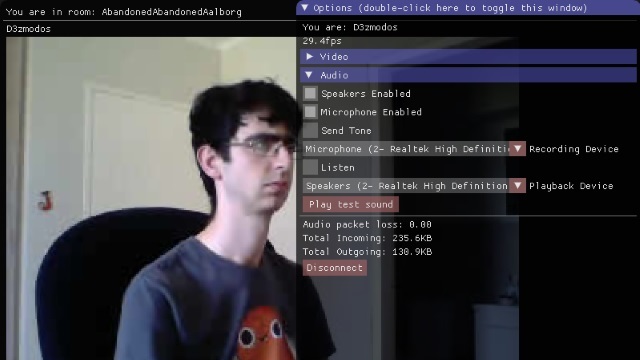 Veek is my attempt at creating an internet video chat program (like Skype or Hangouts). It started with me being frustrated by Skype (and Hangouts…when I decided I’d rather try something else), and I thought to myself “I wonder how hard it would be to do something like that”. Well I now have a new appreciation for the “Works on my machine” joke. The idea is that you don’t need an account, you don’t need to wait forever for it to start up, and you don’t need to spend 30 minutes figuring out how to start a call. The goal is to allow for live video calls over the internet with multiple people and as little hassle as possible. Veek’s source code is available on github, along with binaries for Windows and Linux. I’m not currently working on Veek but I would like to come back to it at some indeterminate point in the future!